Smartcookie's Scrappy Spot: Almost BTS! This is a project I created with my Cricut. I thought it would be a great gift for a teacher friend of mine. I used the Expression to cut the large bushel basket and apples. 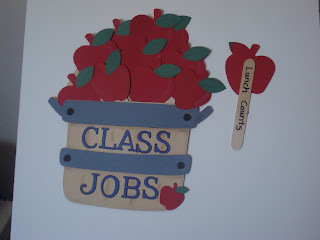 I attached the apples to jumbo popsicle sticks with classroom jobs listed on the back. The students 'pick' an apple to reveal their weekly job. The basket and the apples is from Doodlecharms.